Cut the Sikorski sausage of choice into bite-size pieces. Spread flour on a flat surface, then open and peel apart the layers of biscuit dough. You will need two biscuit pieces for each piggy – one for the body and one for the extra bits (like the ears and nose). Lay the first piece of dough flat. Add one bite-sized piece of sausage to centre of the dough and wrap, pinching ends together at top. Flip over and then brush with egg wash. Using the second piece of dough pinch off small ball and flatten. Cut this in half to form the “ears” of the piggy and apply. Pinch another small ball of dough and puncture with two toothpicks to make nostrils, then attach the “snout” to your piggy. Pinch another small ball of dough from the spare piece and roll it out into a “snake” shape, then twist it up into a “tail” and attach to the rear of your piggy. Add two peppercorns for “eyes”. Repeat process for each piggy until you have as many as you need. 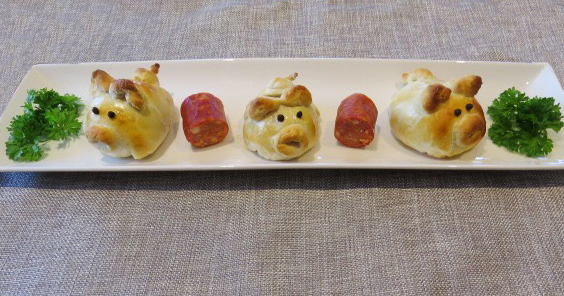 Place your piggies on a cookie sheet or baking stone and bake to perfection for roughly 15 to 20 minutes. Leave the toothpicks in to hold on your “snouts” on until they are finished. Remove toothpicks and serve warm. Heat up any additional pieces of sausage and serve them alongside. For large gatherings, double or triple the amounts and use an assortment of different sausages for a spicy piggy surprise!